The Mammut Element was discontinued in 2017. It was been replaced by the Mammut Barryvox. Mammut will continue to support the Element's 5-year warranty. Summary: The Mammut Element Barryvox is the fewer-featured little brother to the Mammut Pulse. It includes the core features of the Pulse, including three-antennas, a long reception range, marking of multiple burials, solid spike handling, great audible indication, a group check mode, and it supports firmware updates. It also retails for $140.00 less than the Pulse. Pulse versus Element: Mammut is targeting the Element at the "occasional user, beginner, and group participant" and the Pulse at "intensive users, beginners with ambitions [ya gotta enjoy that translation], ski guides, and tour leaders." Do not let the "occasional user" or "beginner" terms mislead you, the Element is an extremely capable avalanche transceiver that ranks solidly in the top tier. And it's a strong competitor with the similarly priced ARVA Neo, Pieps Tour, Tracker2, Tracker3, and Ortovox 3+, and the lower-priced Pieps DSP Sport. The above Summary mentions many of the features the Element shares with his big brother. Let's look at the differences and what they mean. One Button. Whereas the Pulse has buttons on either side and the function of the buttons vary depending on what's displayed on the left and right side of the screen, the Element has a single button. One button is all most people want, or need, during an emergency. LCD Screen. The Element has an LCD screen with an arrow that can point in 9 different directions. That's fairly similar to other digital transceivers with the exceptions being the ARVA Pro W, Pulse, and Ortovox S1 which have fully graphic screens. 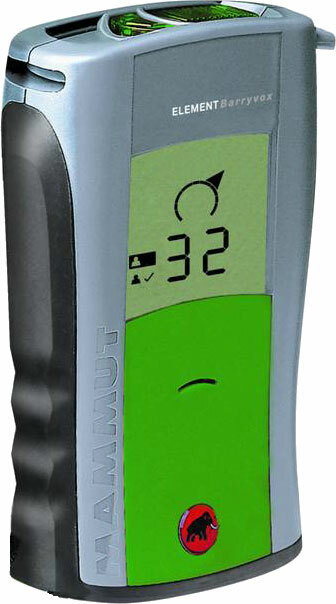 Those graphic screens (in conjunction with internal compasses) allow the direction indicator to freely point in any direction as the transceiver is moved. Although the Pulse's graphic screen is cutting edge, the Element's display is no laggard. Multiple Burial Features. The Element shares the ability to "suppress" (aka, "mark") a receiver during a multiple burial search. Additionally, the Pulse displays the number of transmitters, allows you to scroll through a list of transmitters, lets you select the individual transmitter that you'd like to suppress, and lets you un-suppress a transmitter. It's personal preference whether you want the Element's simplicity or the Pulse's power. Hardware Differences. The Element does not have an earphone jack or screen backlighting. A backlight is useful at night (i.e., when the rescue team arrives), although a headlamp is much more helpful. Configurable. The Pulse allows you to set numerous configuration options including the language (the Element uses icons), a basic or advanced profile (the Element uses a basic profile), enable or disable the direction tones, tweak the pin-point search graphics, specify the time before the unit reverts from search to transmit (the Element is fixed at 8 minutes), optimize the group check mode for skiers or snowmobilers, enable vitals data (the Element does not transmit W-Link data), and customize the startup screen (a nifty feature if you misplace your transceiver). User Manuals. The Element comes with a scant "Quick Reference" manual versus the Pulse's 60 page manual. If any of the above options are important to you, then by all means consider the Pulse. Otherwise, know that the Element is a sweet avalanche transceiver with a great heritage. Searching: In my testing the Element's reception range was identical to the Pulse's range in digital mode (the Pulse's range can be extended in an analog-only mode). The Element has the same recommended signal strip search width as the Pulse (50 meters). The Element has excellent audio indication (increasing cadence, pitch, and volume). The Element, Pulse, Barryvox, and Barryvox S are the only avalanche transceivers to change the audio tone based on the direction you are headed using "directional tones." The only feature that doesn't impress me (and I am impressed by the Element), is that when you are within three meters of the transmitter (i.e., during the fine search), rather than simply turning off the direction indicator, the Element displays a stationary forward/backward arrow that Mammut calls a "landing strip." This indicates that the searcher should only move forward and backward until they find the lowest reading—which is also what the Element's user manual teaches. Personally, I'm unconvinced that the "landing strip" approach is appropriate for anyone. In my experience, it's very helpful to also move side to side during the fine search. Conversely, Mammut feels that "Beginners waste too much time with poor grid searches" (they do). In my limited tested of the "landing strip" approach, it was easy to end up a meter from the transmitter (especially during shallow burials) which resulted in several minutes of needless probing. The display of the "landing strip" isn't a deal-breaker, because you can still perform a forward/backward, side-to-side fine search regardless of the display. 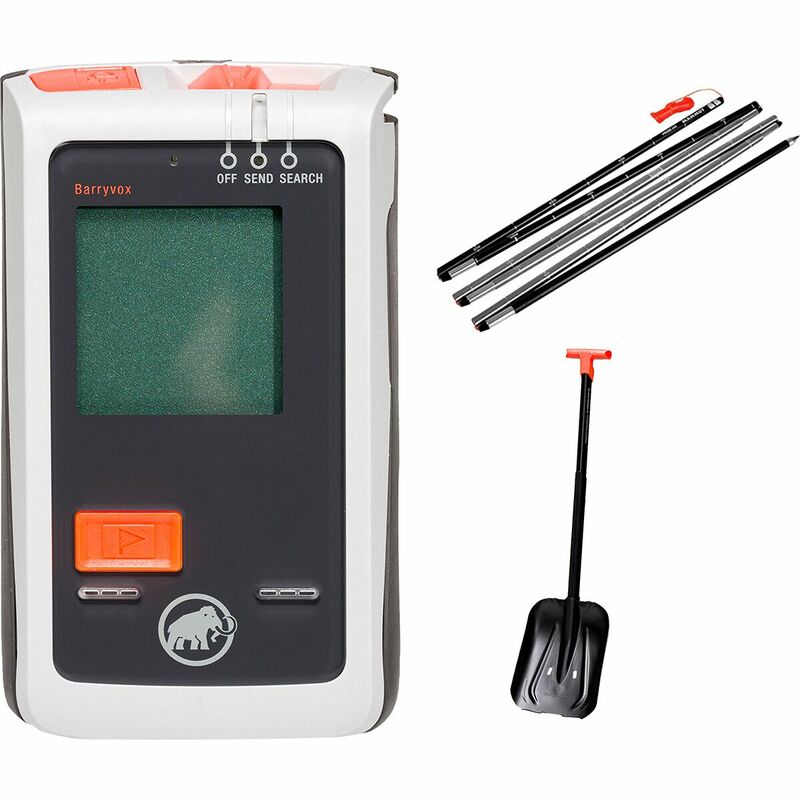 I understand that Mammut knows that they're doing when it comes to designing avalanche transceivers so I'll keep an open mind, but I expect that the 30 seconds of side-to-side movement that would be "wasted" during a fine search, even by a beginner, will save many minutes of probing. FWIW, the Pulse, Barryvox, and Barryvox S allow you to select either the "landing strip" or "cross fire" symbol, although these transceivers default to the landing strip approach. Spikes: Spike handling is as flawless as the Pulse. Multiple Burials: The handling of multiple burials is similar to most digital transceivers (you press a button to "suppress" (aka, "mark") the closest beacon so you can advance to the next). The Element can display one, two, or three silhouettes ( ) to indicate the number of victims. It displays a small "bracket" below the silhouettes when there are more than three victims. The Element then guides you to the nearest transmitter. When you are within three meters of a transmitter, a large checkmark appears in the lower-right corner of the display. Pressing the button places a checkmark next to the first silhouette, highlights the next silhouette, and the direction indicator is updated to point to the next transmitter. Clean. In my relatively limited testing of the Element's multiple burial mode, it was as excellent as the Pulse, but with a simpler interface (you can't move between victims) and without the ability to unmark a transceiver (you'd need to toggle between transmit and search). Controls: The Element's controls are simple: one sliding switch that changes between Off, Send, and Search, and one button that selects an option that is displayed on the screen. Group Check: During startup, the Element displays Group Check in the display. As with the Pulse, it's a bit confusing (i.e., are you now in group check mode?). In fact, the Element is giving you five seconds to press the sole button at which time you will enter the group check mode and the words Group Check will blink. (The initial display might be a little clearer if it asked, "Group Check?"). During the group check mode, the Element will only receive signals if they are at the proper frequency and within one meter. You can press the button a second time to exit the test mode (if you forget to exit the group check mode, the Element will do so after several minutes while beeping a warning). You can read my minor complaints about the Pulse's group check mode. Comfort: The Element has the same holster-style harness as the Pulse. It and the Pulse remain the smallest of the multiple antenna avalanche transceivers. Updates: The Mammut Element supports software updates. Pros: Long range, easy to use, good marking, good audio.